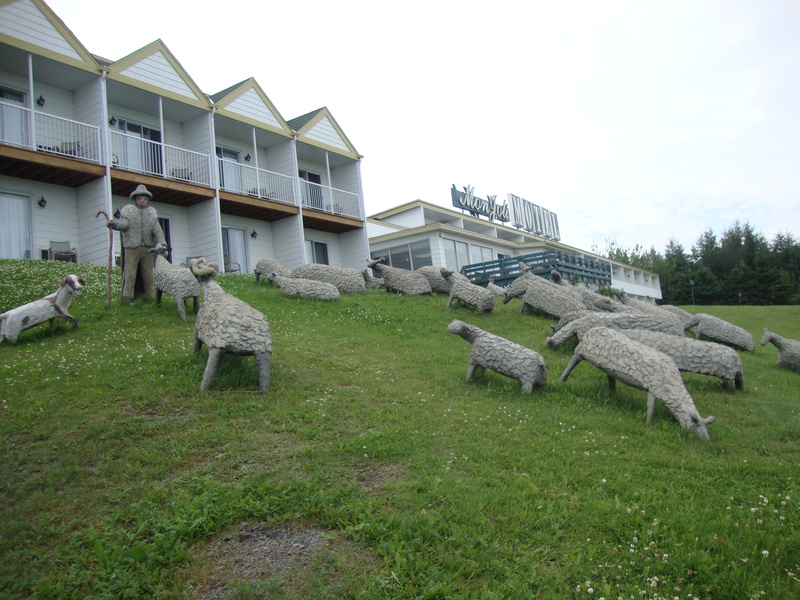 This summer while in Quebec, we discovered a shepherd and a flock of sheep. 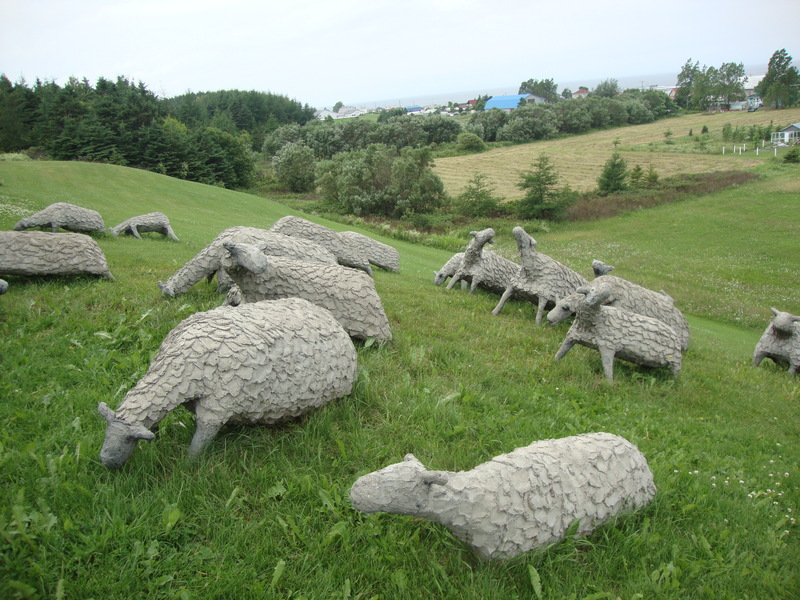 They were in Mont Joli, not far from the small community of Metis where we were staying near the Reford Gardens. The first time we drove by them I asked no one in particular, “What is THAT?” The second time I studied them a little closer (well, as much as I could at 70 km an hour). Finally, I insisted we stop. One doesn’t find a scene like that every day. As my husband and kids waited in the van at the side of the road, I climbed the rugged hill to the top. 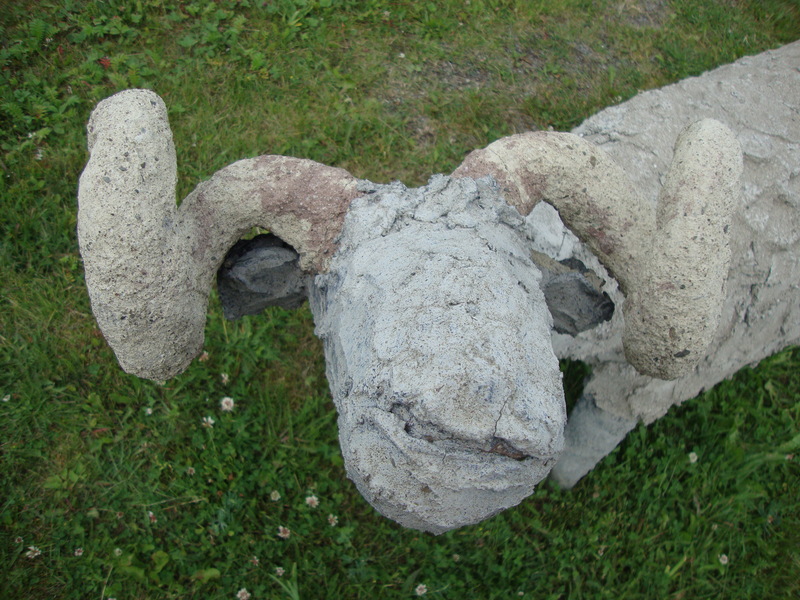 There I came eye to eye with a shepherd and close to two dozen sheep made entirely of sculpted concrete. They were standing just below the Mont Joli Motel and looked out over a farmer’s field with the Gulf of St. Lawrence in the distance. I was captivated. 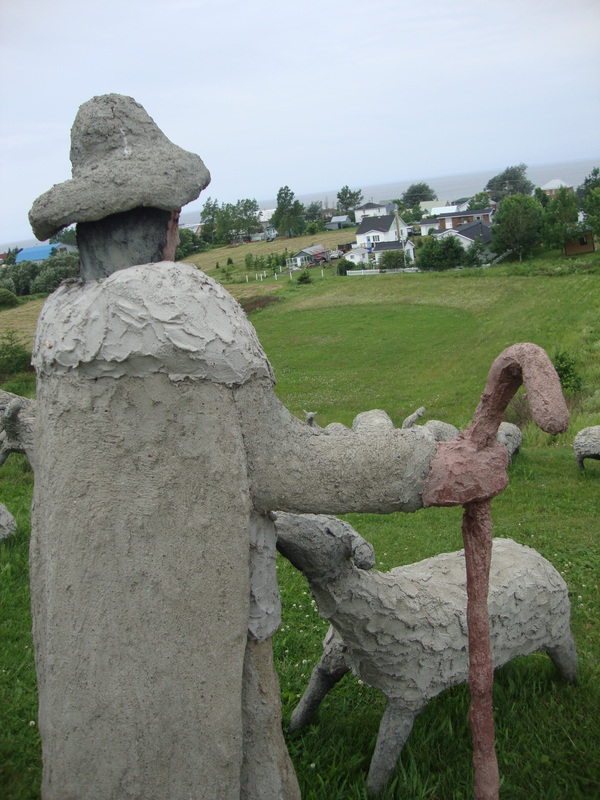 The shepherd, dressed in a cloak and carrying a curved staff, was quite rough to the touch, as were the sheep. As I looked more closely, each sheep was unique, in a different position, facing a different direction, or with slightly different features. They were obviously made by a highly skilled artist who was concerned not just with shape but with texture. Strangely, despite doing some research, I have found no real explanation for the sheep or their shepherd. They are part of the motel property to be sure, and a photo of them is on the web site. Such such a huge project would have cost a great deal in time and money. Someone must have been very passionate to go to so much trouble creating them. Walking through the flock, the grass was lumpy underfoot and the terrain more rugged than I had expected. Isn’t that just the way, I thought to myself. For all of us who are called into pastoral ministry–called to shepherd our flock–it is rarely smooth sailing. Sometimes we stumble, walking in the pasture with our sheep. It is important to keep our feet firmly on the ground. The weather was sunny and cool as I took photographs. It was warm enough to be pleasant, however, and standing overlooking such a beautiful vista was lovely. Then I began to think ahead a few months and realized that January for that shepherd would be far from easy. Biting winds, snow and ice would come at him from all directions. And he would stand there, secure and unmoving, through it all. That is what ministry is all about, I suppose–having the courage to go to where the sheep are, even if the ground underfoot is a little rocky, and then staying with them no matter what the weather. One of my friends is enduring a painful transition in her congregation right now and it will take a great deal of strength to continue when common sense says to seek shelter, even if it means leaving others behind. I think of her when look at these photos. I don’t know what the artist of that shepherd and sheep had in mind when they were created, but it almost doesn’t matter. It was a good reminder to me of the hard work of ministry. More than that, it was inspiring to consider that shepherd. May all of us who lead our flocks do so with his strength and faithfulness. This entry was posted in Uncategorized and tagged church, inspiration, life, Quebec, Reford Gardens. Bookmark the permalink. Only one word comes to mouth and mind — wow! BTW, I shared this post on http://versatilebloggeraward.wordpress.com because it is just so awesome! Thant is so kind! Thanks for stopping by and reading! You are so kind–thank you for the encouragement! I’m glad you enjoyed reading.